As I previously mentioned Steve has been very busy making batches of his olive oil cold processed soap, and the house smells amazing. For fall he has been developing recipes of fall centric fragrances. His soap is often like my silk dying – there is a known and expected outcome, but sometimes the way the color processes leaves room for a wow factor. And that is what happened with his pumpkins spice soap. 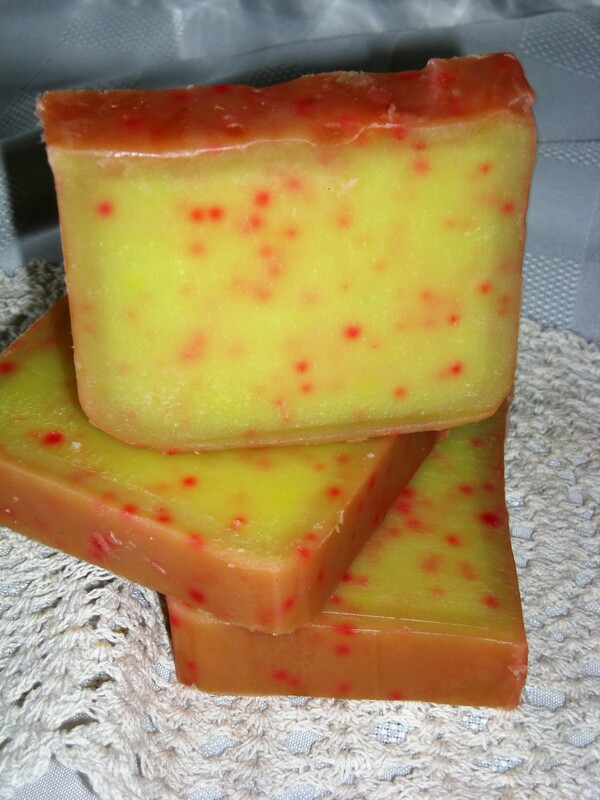 Initially when the batch of soap was prepared the color was a very dark pumpkin orange. The soap has to cure for several days in the loaf mold, and when it is dry enough to handle it can be removed and cut. That is where the magic happened. The rind of the soap still looks like a rich pumpkin color, but the interior of the soap has taken on more of the color of pumpkin flesh. Amazing. And the smell is so good that if you close your eyes you think there are fresh baked pumpkin muffins on the table. Doesn’t that soap look amazing! I am so impressed with the skills and knowlege my hubby puts into his soap making. And he is always in the development of new items and fragrances. – September 11th from Noon – 3p “The art in nature series” at Lake County’s Chapin Woods. Music, Artists and a lovely park experience. A fitting way to spend 9/11 in rememberance of that tragic day. Looking for a bit of adventure in your weekend… stop out and visit us on one of these dates.